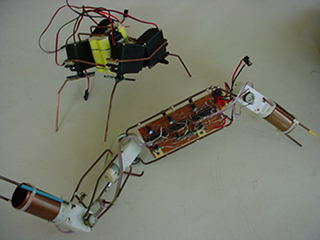 The new version of "Insectroïdes"
Welcome to the world of BEAM robotics. This web site is dedicated to my 2000 science fair project called "Insectroïdes". If this is your first time visiting the NEW version of "Insectroïdes" please click here to learn more about the left menu and the web site. First, I would like to thank all the people who send me comments, questions, ideas, etc to me via the feedback form. I have receive many, many e-mail asking questions on robots. I don't respond to all e-mail but I read all of them. Please don't be disappointed if I did answer your e-mail. I will, one day respond to your e-mail. I am making a FAQ and you could find answer from your e-mail and other people question. I have build a robot snake like Mark tilden gPim. I made some SMT bicore PCB and I will post a tutorial on how to make photosensible and non- photosensible PCB. Set as home page Bookmark Us!